For people in wheelchairs, activities like going to work, the grocery store, or get-togethers with relatives require getting a ride from someone or paying for taxi service. Lawyer-turned-entrepreneur Stacy Zoern was not willing to live with this limitation and now is building a new kind of car in Pflugerville, Texas. Zoern was an intellectual-property lawyer in Austin, when she began searching for ways to get herself, and others in wheelchairs, mobile again. 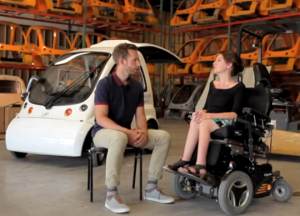 Zoern quit her job and began to build her company, Kenguru, which has designed small electric cars specifically for people in wheelchairs. The cars are 7 feet wide and 5 feet tall. There are no seats, so the driver can simply wheel in through the back of the vehicle. A ramp lifts and lowers automatically when the rear door opens. The steering wheel isn’t a traditional one either. 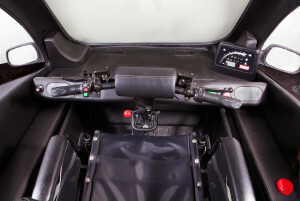 Instead, Zoern transformed it into a set of motorcycle handlebars for easier control. After building a management team, fundraising and meeting with manufacturing and engineering partners, Kenguru secured $4 million from investors and plans to start production later in the year. The car goes only about 35 miles per hour, so it is meant for local trips only on neighborhood streets. The car’s battery range is about 60 miles. 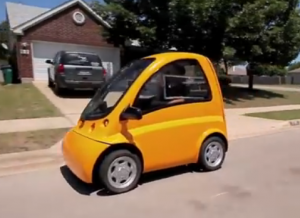 Kenguru cars are projected to sell for around $25,000, but the cost could go down, depending on federal green energy and mobility tax incentives for some buyers. From industrial wheelchairs to smart cars with automatic ramps, innovation is everywhere, granting those living in wheelchairs the freedom of independent mobility.